World Cup Ping Pong, a $1 3-D table-tennis simulator from Skyworks with a free lite counterpart, is packed with features and looks great. Unfortunately, it’s just not very fun. That’s A Paddlin’: World Cup Ping Pong offers plenty of modes and beautifully-rendered 3-D graphics. But those paddles are hard to control. Let’s start with the good stuff: World Cup Ping Pong comes loaded with modes. There’s practice mode, head-to-head two player (which gets a little crowded as you play live on just one iPhone), Arcade Mode, and Tournament Mode. You can play as different nations, and you can choose paddles with different power/spin ratios. When you play, the game moves quickly, and technically, it plays well. The sound is perfect, and the 3-D table is beautifully rendered. The big negative, sadly, rests with the controls. Keeping your finger on the screen to drag your paddle back and forth into position comes with two big “gotchas.” First, dragging that consistently across the screen gets a bit unpleasant on the tactile front; somehow, the inability to lift that finger “for air” starts to cause friction problems. Even worse, though, when you couple your finger placement with the game’s 3-D perspective, you’ll immediately note that your finger is a fairly opaque appendage. Too often, you can’t see the tiny white ball returning, since your big fat finger is in the way. All those modes, and the global high scores list, give World Cup Ping Pong plenty of depth, and there’s clearly a good game buried in here. But this is one iPhone game that I’d suggest needs a little less multitouch to become more playable. The Lite version offers only a single volley mode, where the first player to seven points wins. Obviously, it suffers the same control issues, without the extra features to try to sweeten the deal. 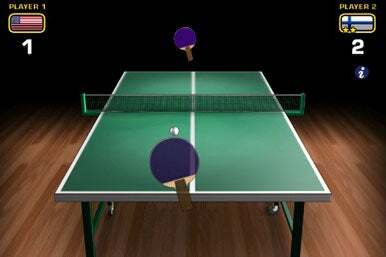 Both the paid and free versions of World Cup Ping Pong are compatible with any iPhone or iPod touch running iPhone 2.2.